In Avengers: Age of Ultron, Tony developed a new Iron Man armor that successfully breaks through Sokovia enemy defense line with its superior technology. The artificial intelligence of Mark 43 further helps Iron Man secure his position as an essential member in Avengers. Beast Kingdom is excited to present the Egg Attack EA-018 Mark XLIII from Avengers: Age of Ultron. 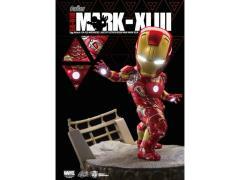 The Mark XLIII is introduced in a new 8-in size and presented in Egg Attack style. The Iron Man Mark XLIII has been made 100% true to movie settings, painted with metallic paint to show Mark XLIII’s battle damage look. Intricate details are shown in the face, abdomen and joints, also including LED-lighted eyes, chest reactors, palms, and feet. When paired with a snowy Sokovia scene base, it’s as if the real fight has been brought to life!